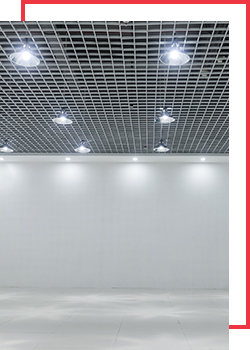 Beneficial in both residential and commercial applications, dropped or suspended ceilings provide both aesthetic and acoustic advantages. Engineered to be installed quickly and without much disruption, metal ceiling grids are an affordable and efficient way to update any space. At Diversified Construction Services, we are proud to be known for our expertise in the design and installation of ceiling grids. Having installed thousands of square feet of exposed grid, concealed grid, bandraster, and drywall ceilings, our crews know more than the average contractor about dropped ceilings. As your trusted local contractor, we first schedule an on-site consultation to get a true assessment of the interior space, its challenges and needs, and your goals and expectations. We’ll make knowledgeable recommendations, keeping your objectives, budget, and timeline in mind. We’ll choose structural types and materials to suit your needs while maintaining a goal for superior construction and long-term reliability. Every step of the installation process will be carried out by a Diversified team member, never being contracted out to a third-party contractor. From initial consultation to final inspection, we promise a level of client-focused care that is meant to exceed even your highest expectations. Find out just how far our commitment to your satisfaction truly goes by scheduling your dropped ceiling installation estimate now. We promise a prompt and friendly response by a local professional.